← As a player, I enjoy action points, so why do I dislike them as a dungeon master? When designers of fourth edition Dungeons & Dragons devised the roles of controller, defender, striker and leader, they focused attention on granting characters of each role equal time to shine. At this, I think they succeeded. Despite this success, the game would play better if the game made two roles worse at their job (and made everyone but strikers better at dealing damage). The 4E designers struggled to enable every class to make a damage-dealing attack on every turn, so no one feels bad about “wasting” a turn buffing, dispelling or—heaven forbid—healing. How ironic that unless you play a striker, your puny damage is hardly worth the arithmetic. I routinely see a single striker deal as much damage in a round as the rest of the party combined. In ordinary, level-appropriate fights, a party without strikers can still grind out a victory eventually, but who has the time? Several times a year, I act as a dungeon master at conventions. Typically, conventions strictly limit scheduled game sessions to 4½ hour time slots. As a convention dungeon master, managing time and the game’s pace becomes critical. I strive to bring every adventure to a satisfying conclusion within the time allowed. When I seat a table with a few strikers, I know that I can spare some extra time for that role playing encounter. When the table lacks any strikers, I face the delicate task of rushing the session without making the players feel rushed. As the 4E designers worked out the game’s math, they should have pushed some of the striker’s damage potential to the other roles. Even with the adjustment, we would never see a party where no one wants to step up and play the striker. The fourth edition design tries to make combat fun by making it fast moving and dynamic, but the game undermines this asset by included defender abilities such as Combat Superiority that can stop a move. Defenders play best when they damage creatures that attack vulnerable characters, not when they lock monsters in place. Fourth edition D&D seeks to make parties viable even when they lack a character to fill a role. Traditionally D&D parties required a healer/leader. The 4E design succeeded in making a leader optional, but more than one party leader limits the fun. With more than one leader, the monsters lose the ability to threaten the party, while the party reverts to a five-minute work day. And as I’ve discussed, if the extra leader replaces a striker, combat grinds to a crawl. In fourth edition D&D, healing surges represent a character’s reserve of vitality. Logically, you might suppose that a character could expend a surge’s vitality to perform feats unrelated to healing. Players would readily trade surges for something like an extra encounter power. After all, how often do you run out of surges? By design, the game rarely, if ever, uses surges as a resource for anything but healing. If characters could spend healing surges willy-nilly, they could easily burn through a day’s allotment in a single fight. Afterwards, they need an extended rest and the five-minute work day returns with a vengeance. In effect, characters in parties with multiple leaders can spend surges willy-nilly—more healing surges than intended by the 4E design. Monsters cannot deal enough damage to endanger characters with access to such deep reserves, but a single, tough fight ends the party’s five-minute work day. The game would play better if characters could only spend a limited number of surges in a single encounter. Against lots of enemies, a controller’s area attacks can shine. But in 4E, characters only face lots of enemies when most are minions. But in practice, minions rarely last more than a round or two, even against non-controllers with access to powers like cleaves and whirlwind attacks. Even the surviving minions typically lack enough damage potential to matter. Against solos and elites, a controller’s action denial can become decisive, but action denial makes encounters into boring grinds or one-sided romps. As fourth edition matured, the design of new solo and elite monsters has evolved to nullify attacks that deny them actions. Overall, this change benefits the game, but it weakens controllers. When a party battles against overwhelming opposition, but has objectives to accomplish, the controller really shines. In fourth edition, I think the most enjoyable encounters pit the players against creatures they cannot hope to defeat, but which give the characters an objective that ends the encounter. In these battles, the striker’s damage hardly matters and the controller’s ability to hinder and obstruct becomes truly valuable. 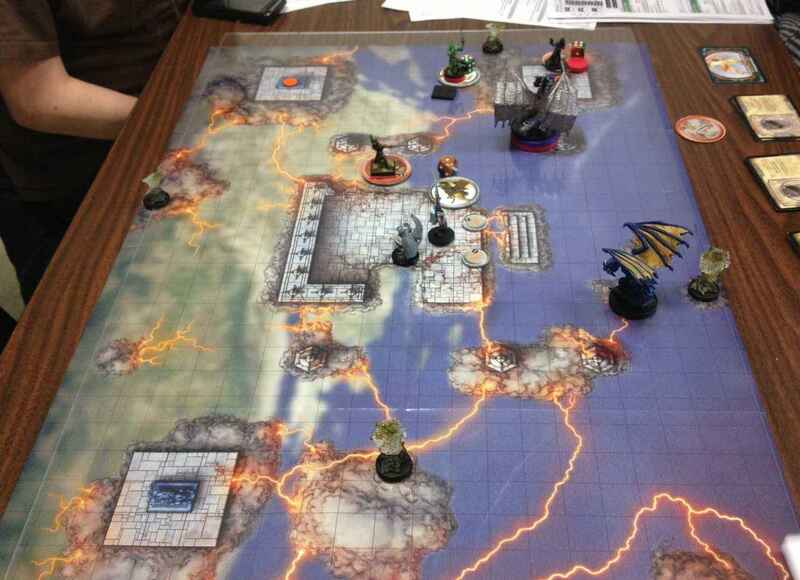 A party stacked with controllers works well in a goal-oriented challenge like the Temple of the Sky God Lair Assault, and I love playing a controller against overwhelming odds in the D&D championship. Alas, most D&D encounters remain battles to the death—or at least until one side gives up the fight. Fourth edition’s mature design now locks each role in place with all its advantages and drawbacks. As a dungeon master or adventure designer, you can make the most of game by adding encounters that include more objectives than slaying the opposition. And as a player, if you want time to explore and interact, bring an extra striker. This entry was posted in D&D fourth edition and tagged Character roles, controller, defender, leader, striker, Temple of the Sky God. Bookmark the permalink. 9 Responses to Which two D&D roles are too effective? I’m no fan of D&D, that much is obvious from my other comments. But you seem to be a really good GM in so many respects. Can you help me understand why 4e roles are not a form of railroading? Other than making things simpler for the novice player or pseudo-story effect (like playing Conan, i.e. 2-D characters), are there advantages to roles other than game effects? To my way of thinking, railroading comes when the game master curtails the players decisions to suit a pre-conceived plot line or to suit simple convenience. Crucially, players choose their classes and select roles. Admittedly, a character’s role focuses your character on certain combat activities—healing, damaging enemies, or protecting allies, but no more than your class selection did in earlier editions. If you dislike seeing characters limited to class archetypes, then clearly D&D is not the game for you. I understand the sentiment. At one time, I felt that the limitations imposed by classes meant that classes were always bad. I’ve learned that characters in classless systems have a tendency to all become just about equally good at all the same things, so now I see the virtue of the archetypes. Of course, classes and strong archetypes suit D&D’s pulp fantasy better than other genres. The 4E designers used roles to make the link between your class and what you do best in a fight more explicit. Without roles, a 4e novice might wrongly suppose that a fighter would do a lot of damage, and fail to select a nature-loving ranger or a sneaky thief for maximum damage output. On the subject of railroading, 4E promotes railroading by encouraging DMs to create grand, set-piece encounters that take significant time to set up and play. DMs don’t want to waste time prepping a fancy encounter only to see it skipped, and nobody can afford to invest 2 hours on an encounter that leads nowhere. Part of the 4E encounter design comes from the game’s skip-to-the-good-part design philosophy—a philosophy that emphasizes grand combat encounters as the good part. Also, 4E requires big encounters to challenge characters because they regain so many resources between encounters. Mere skirmishes cannot challenge or even appreciably weaken 4E characters. They might even gain action points and grow stronger. There was no better way you could have possibly said this. So 4e, by design, is a railroading RPG, because that’s what people want, or at least what sells? I think the problem is that your use of the word “railroading” is very different to the way the word is used in RPG circles. While the roles do essentially describe what role a character will play in combat, that’s only part of the game. And even in combat a character can play more than one role so it’s not true, in my experience, that a particular role “straitjackets” (probably a better word than “railroading”) a character into performing only one function in combat with, perhaps, the exception of the healing provided by leaders. As for what sells, clearly it’s not 4E or the edition would not have been brought to a premature end so that the WotC designers could spend three or so years trying to create the ultimate retro edition (aka Next). Thanks for the insight. I’m still amused that 4E made classes like rangers and thieves the kings of the battlefield, as opposed to the expected classes like fighter. I’ve played the game during its first year (from the open beta to well inside the dragons campaign) and let me tell you that calling the powers with the same names while putting them on a cooldown clock can not be called “emulating the 4e rules” in any significant way. The game got rotations, items buffing values expressed as percentages, farm-to-have-fun socketable gems with even more bonuses… it was a classic MMORPG with a D&D 4e maquillage and feeling, but it had nothing to do with the rules of the game (I laugh at all the people that described tabletop 4e as a MMORPG, they have no idea what they’re talking about).